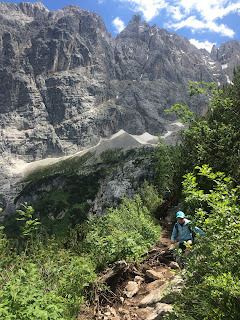 As the last runners of Lavaredo Ultra Trail were shuffling towards Cortina Ice Stadium to pick up their drop bags on this sunny Sunday morning, we were already heading out for a great new adventure with TPjr. 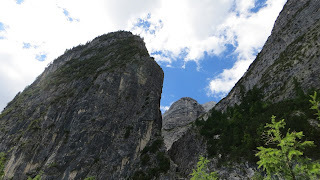 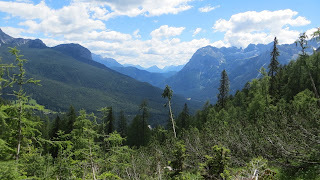 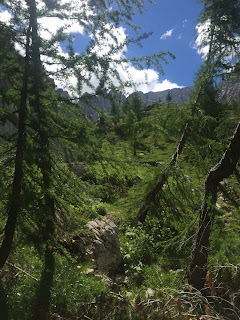 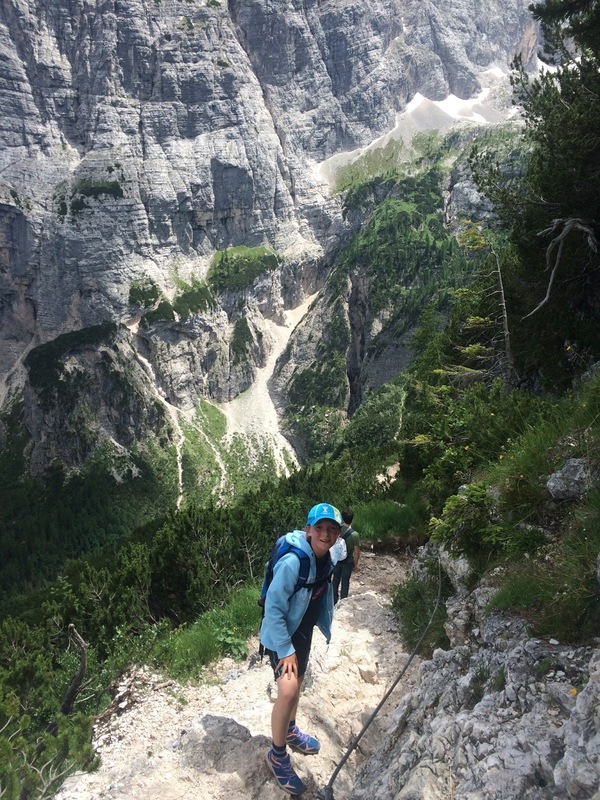 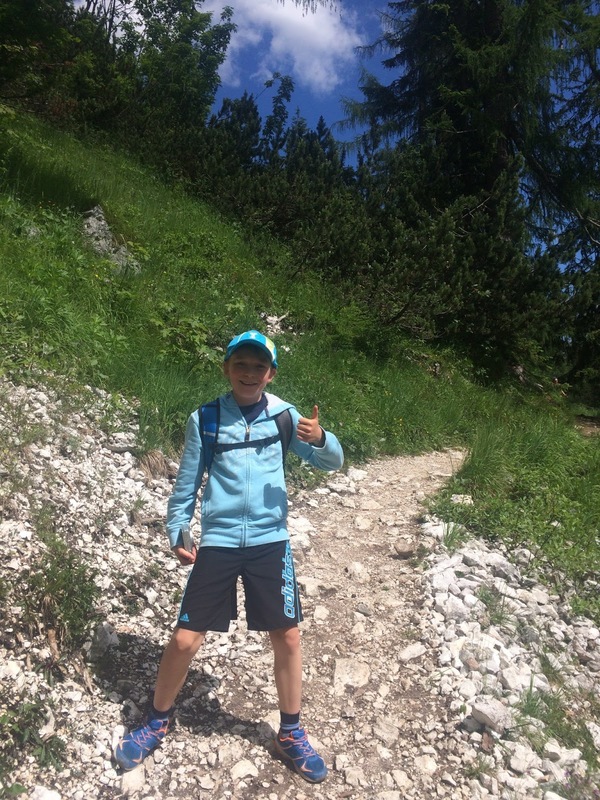 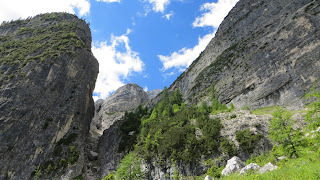 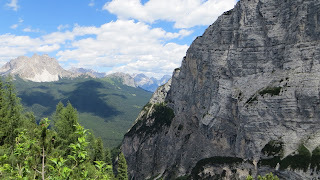 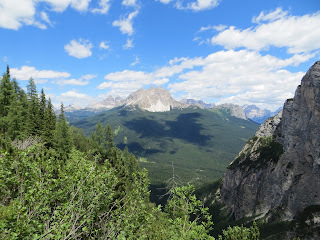 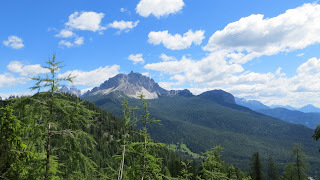 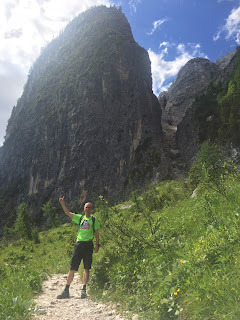 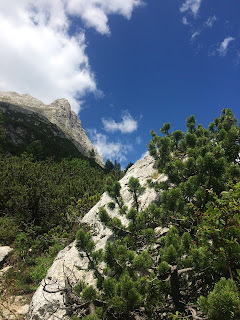 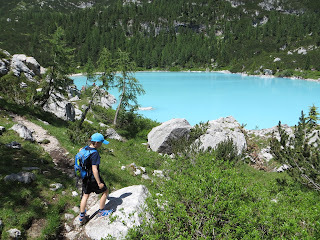 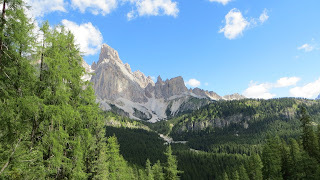 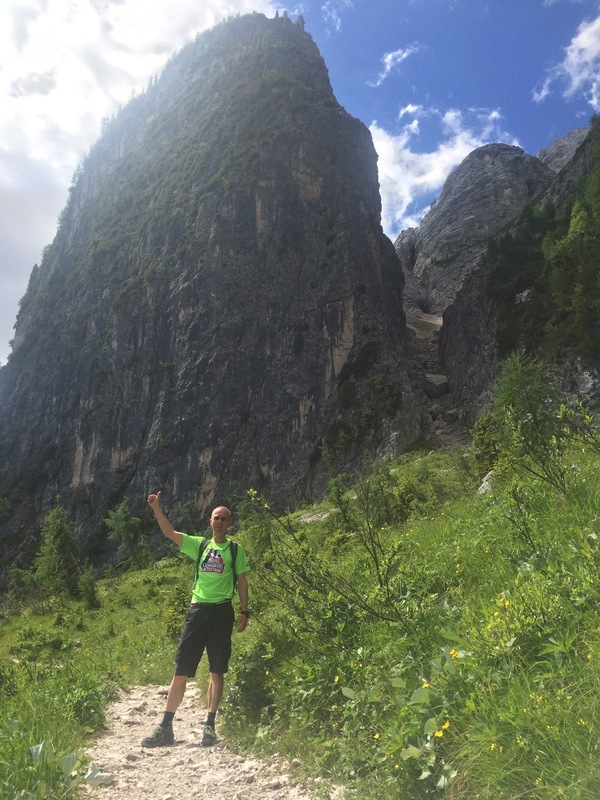 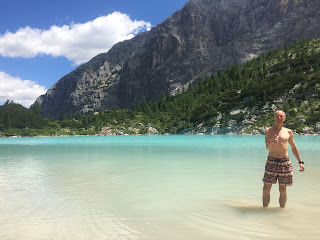 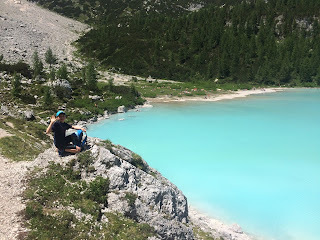 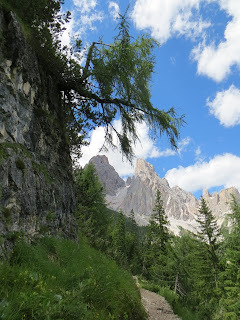 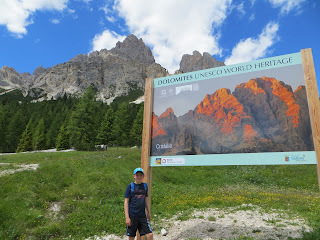 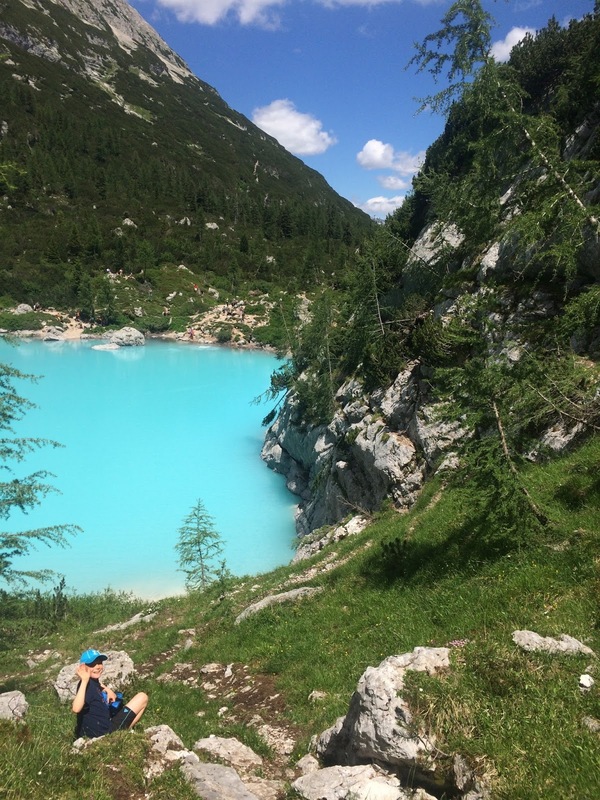 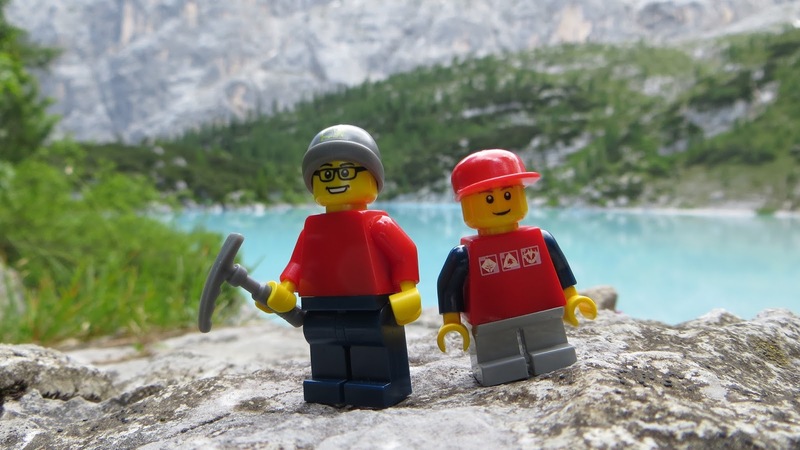 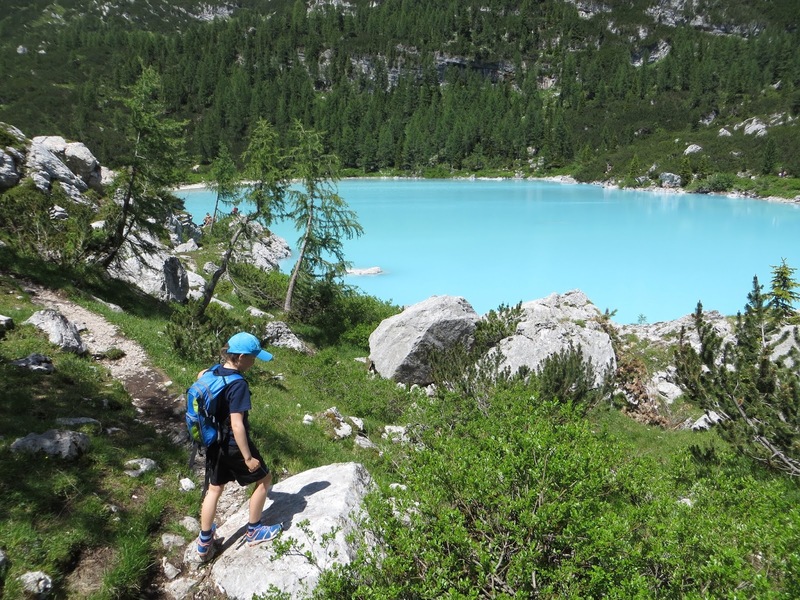 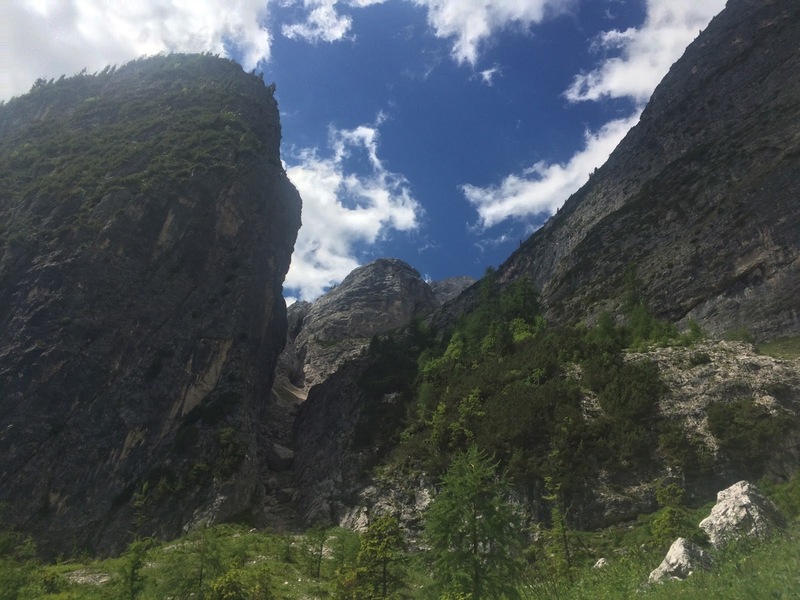 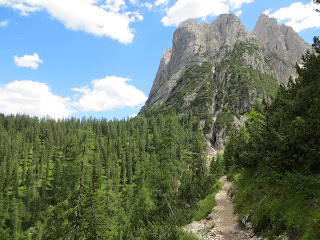 It was our purpose to find and run the most awesome trail in the Dolomites. 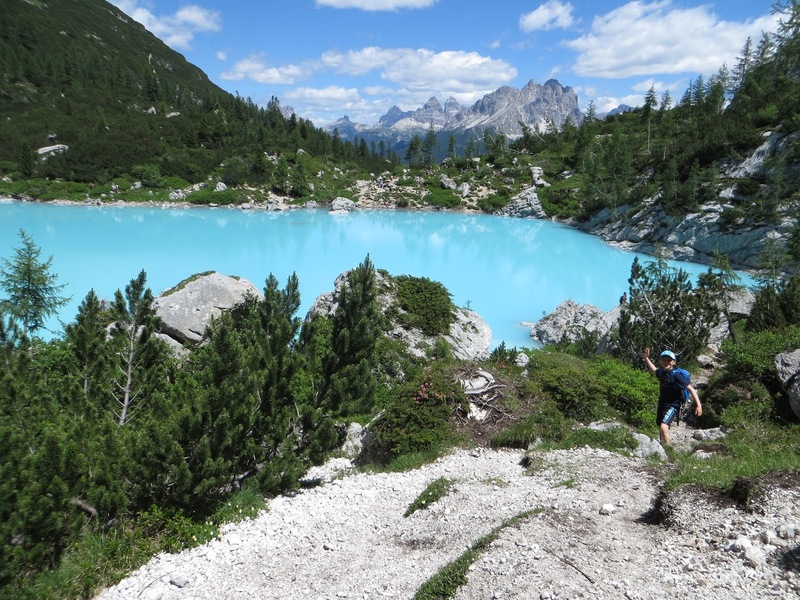 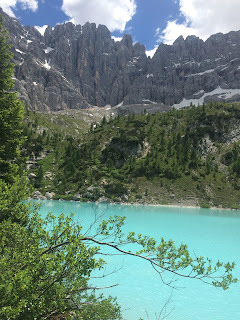 As far as awesome places for mountain trailrunning go, the Dolomites in Italy is generally ranked among the best in world. 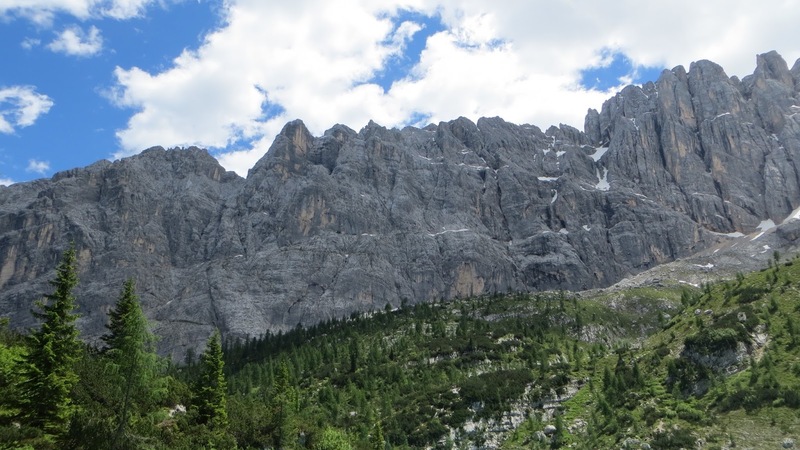 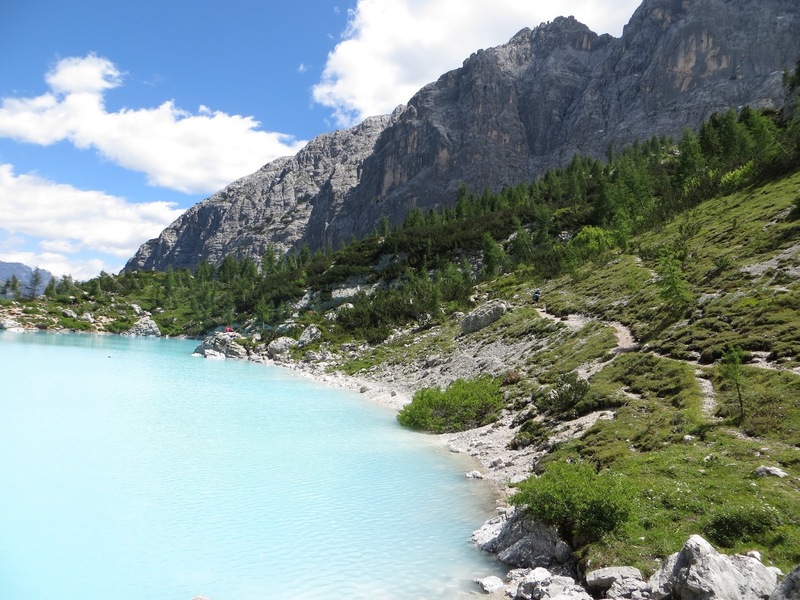 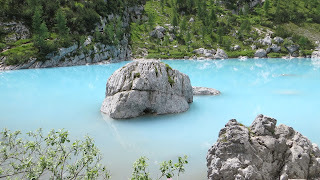 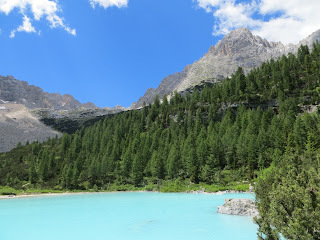 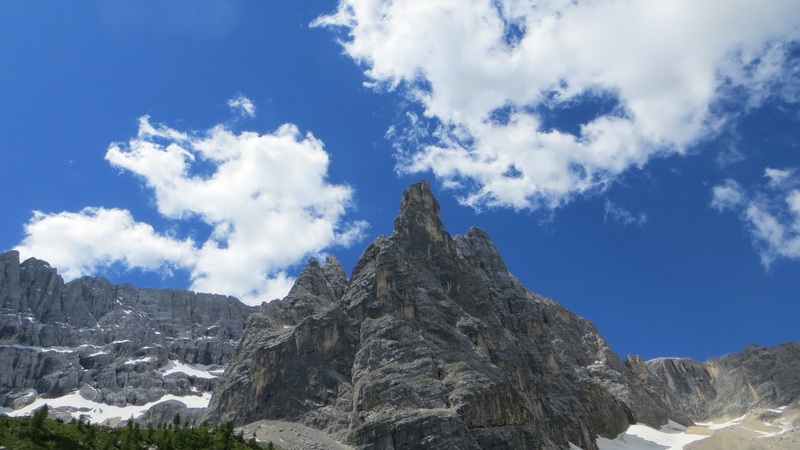 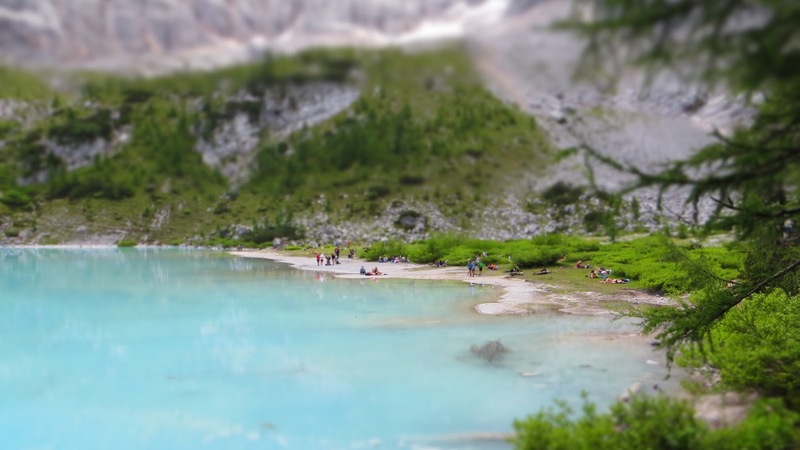 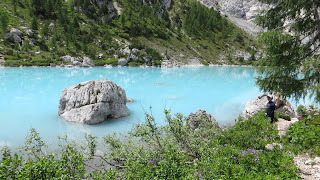 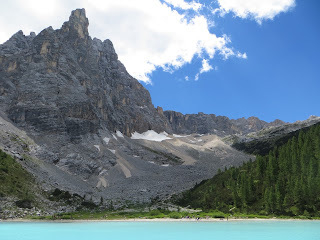 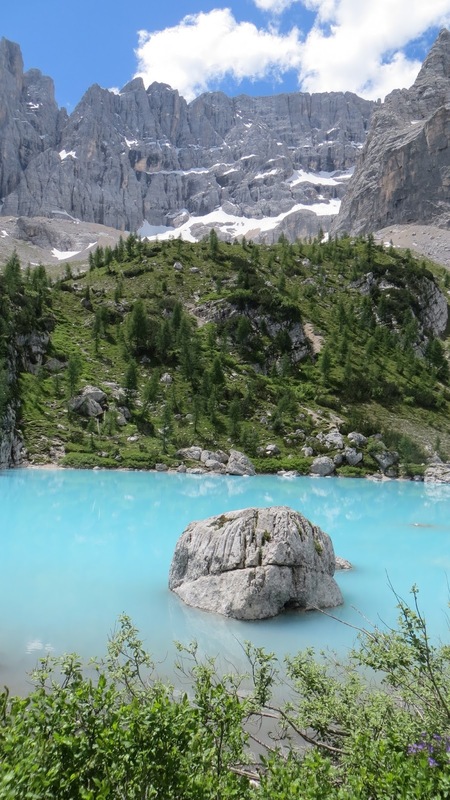 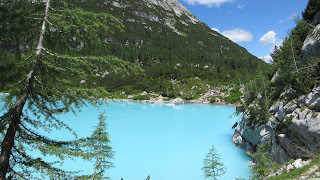 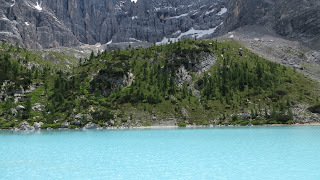 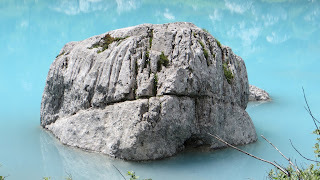 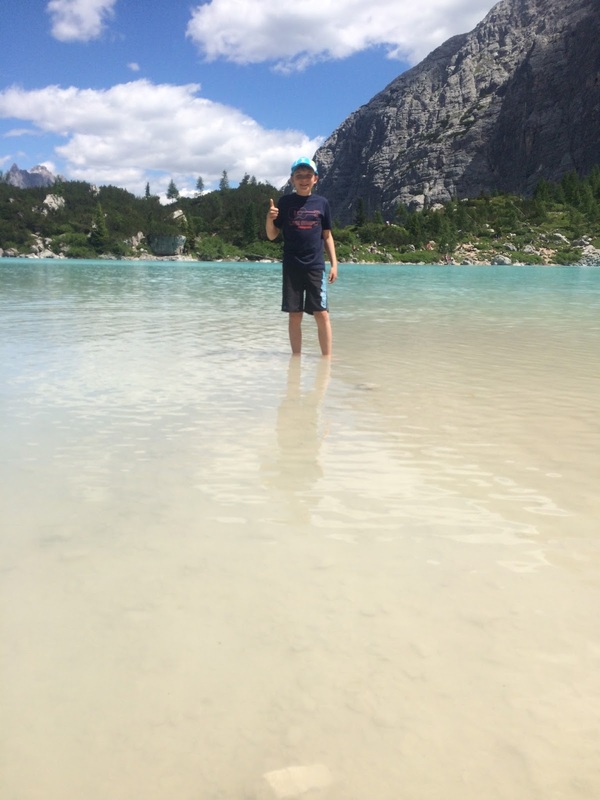 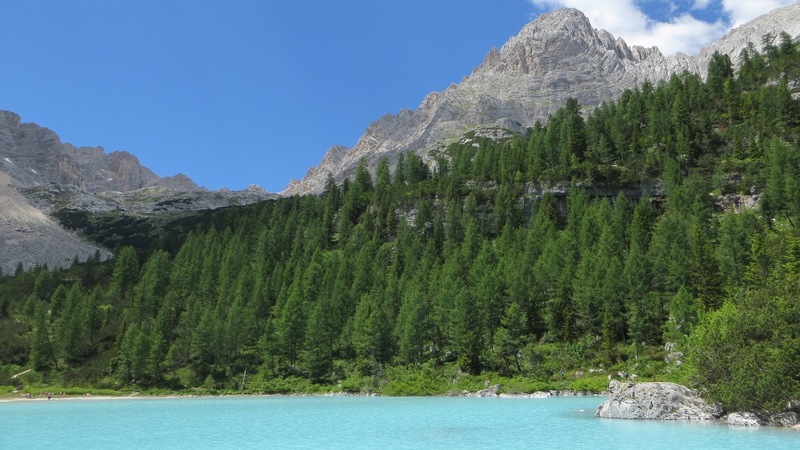 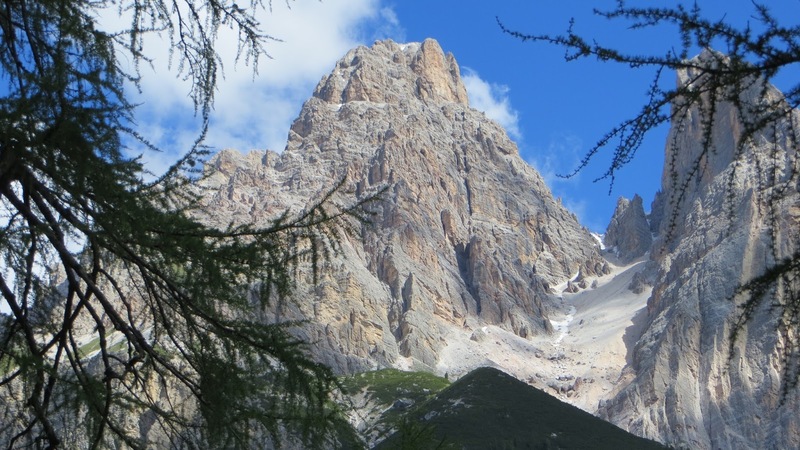 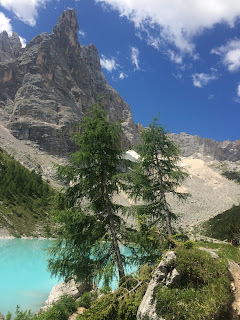 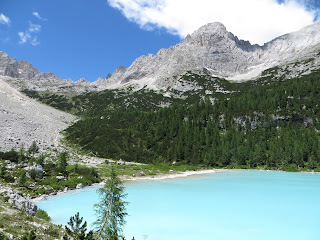 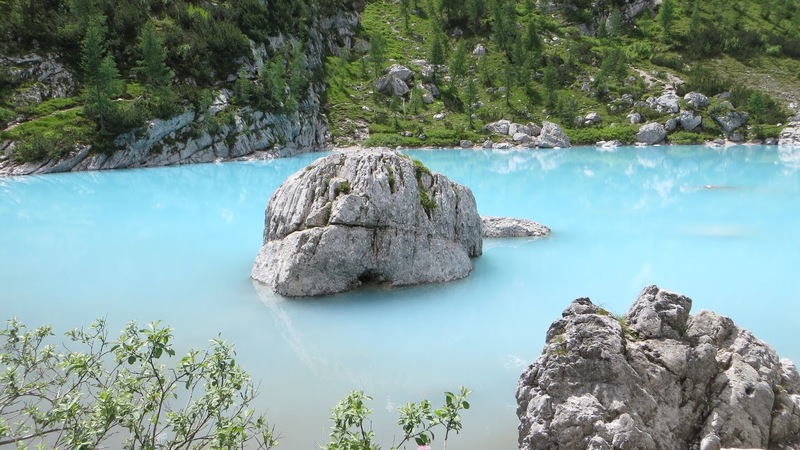 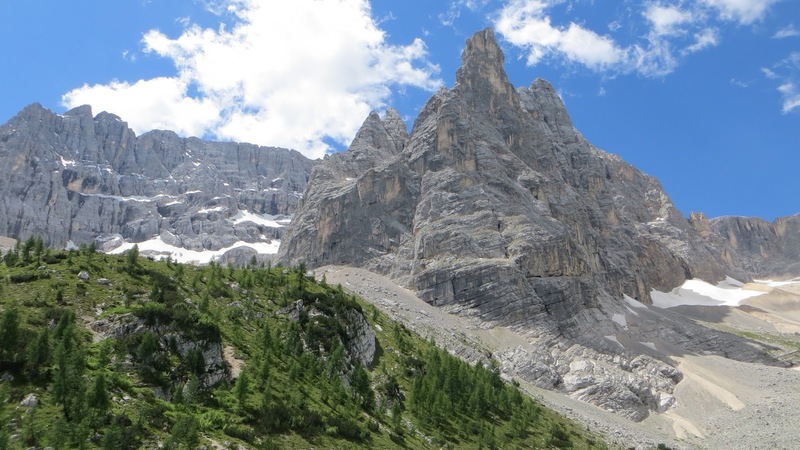 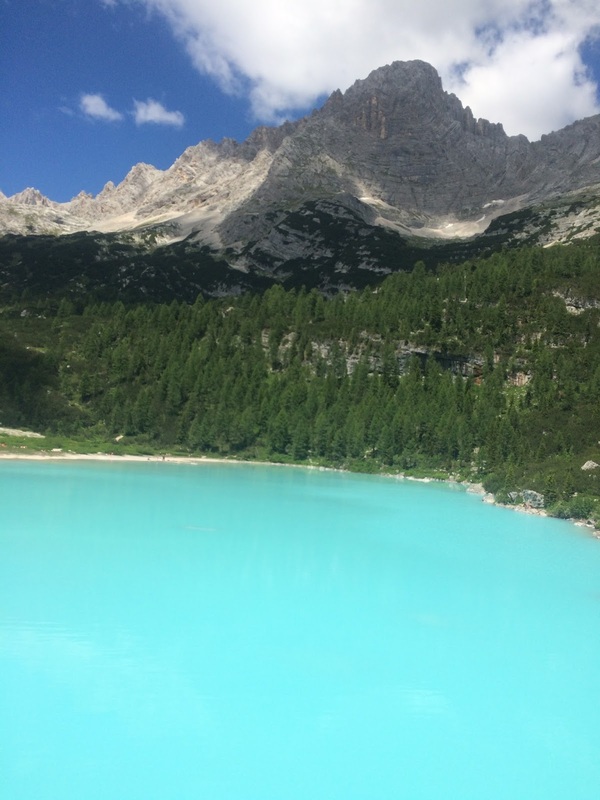 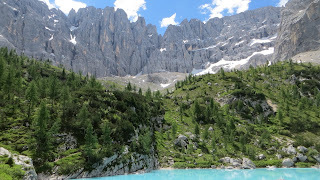 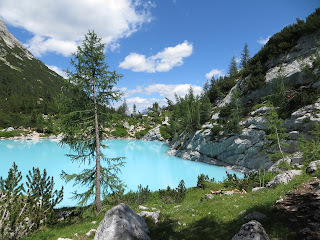 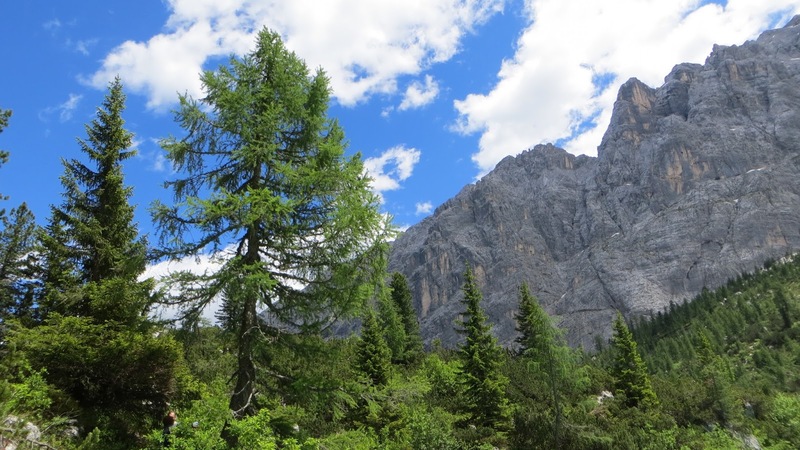 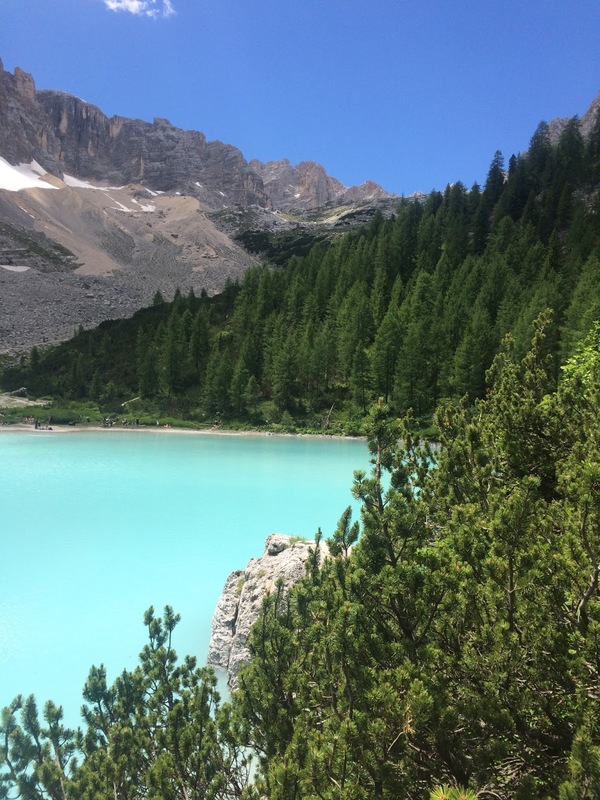 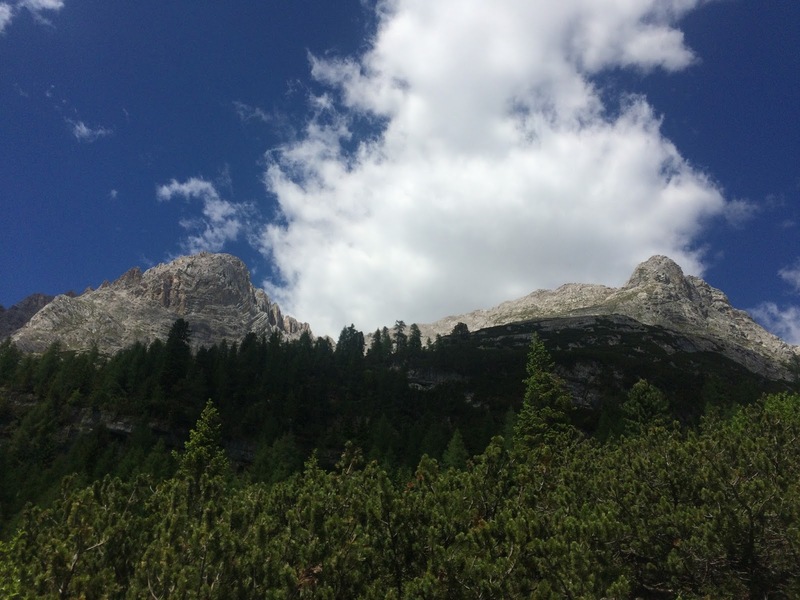 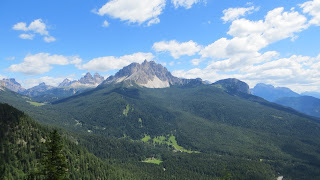 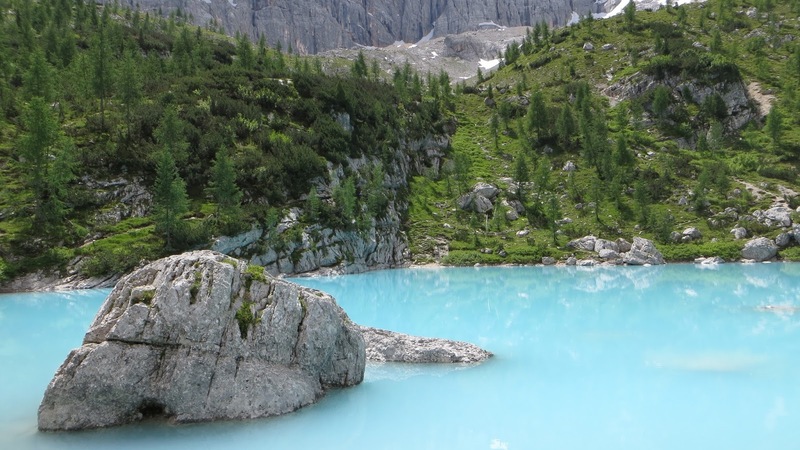 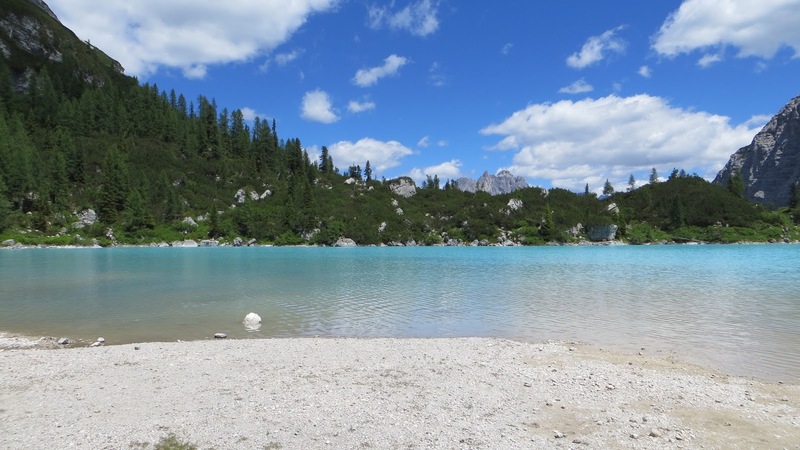 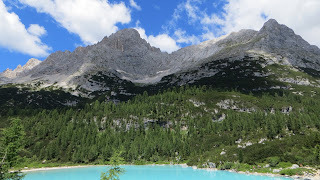 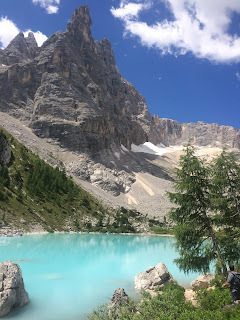 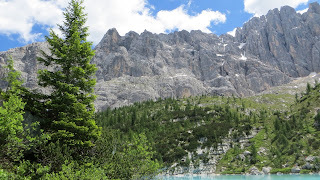 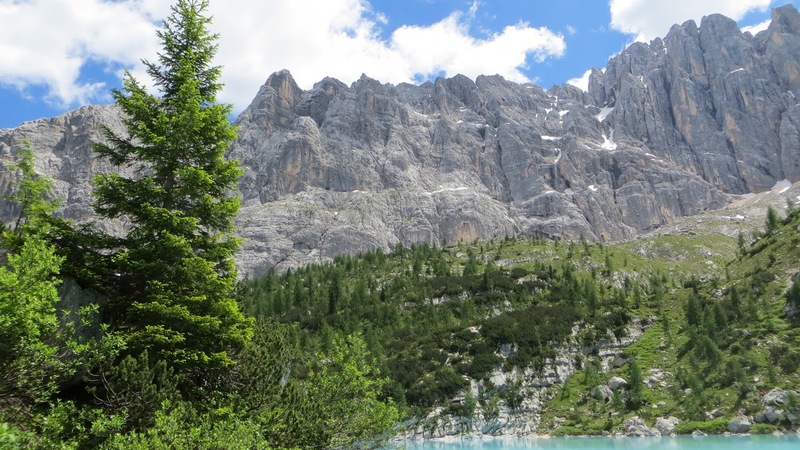 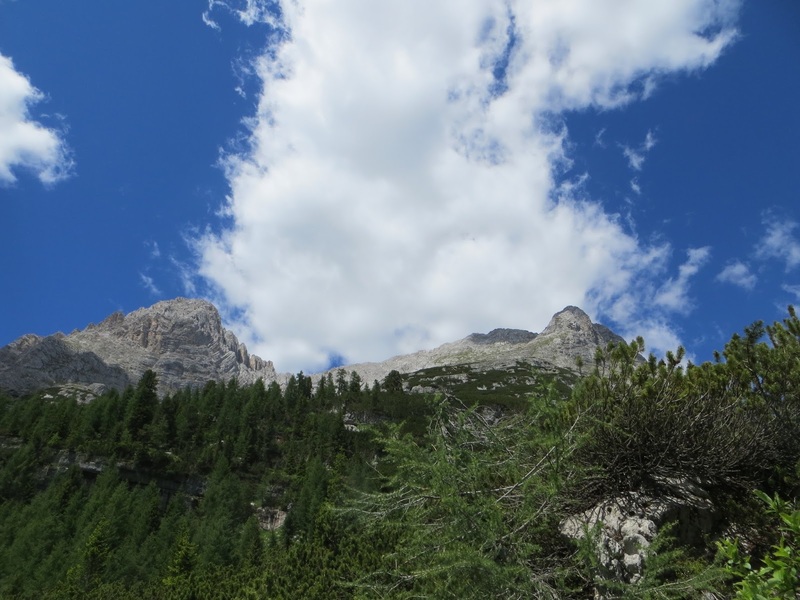 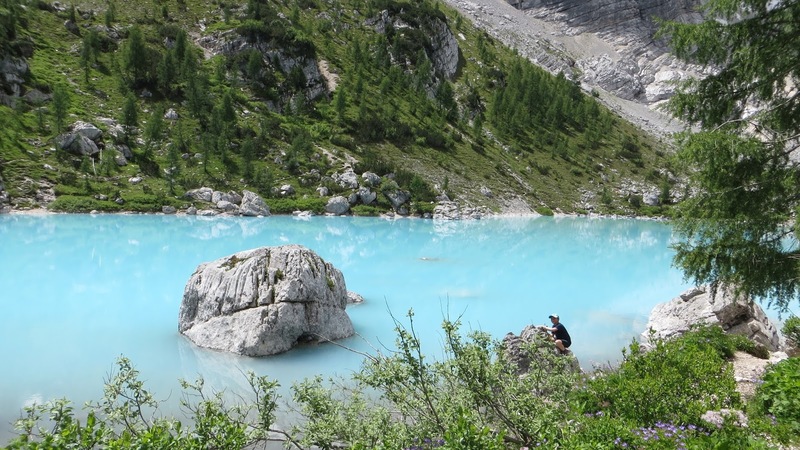 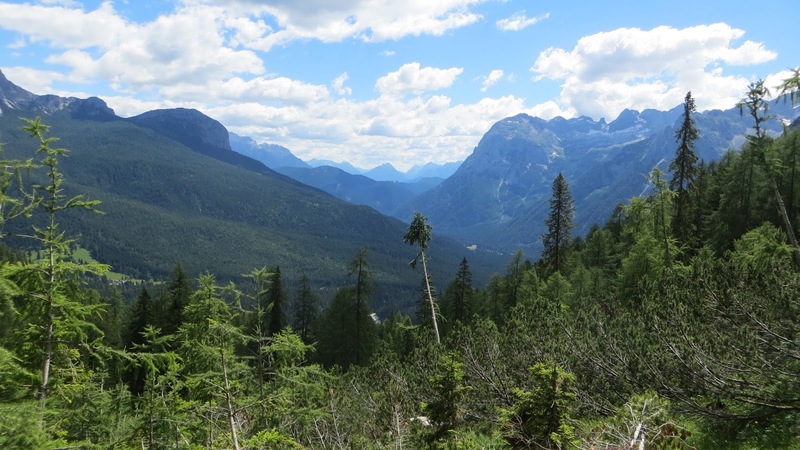 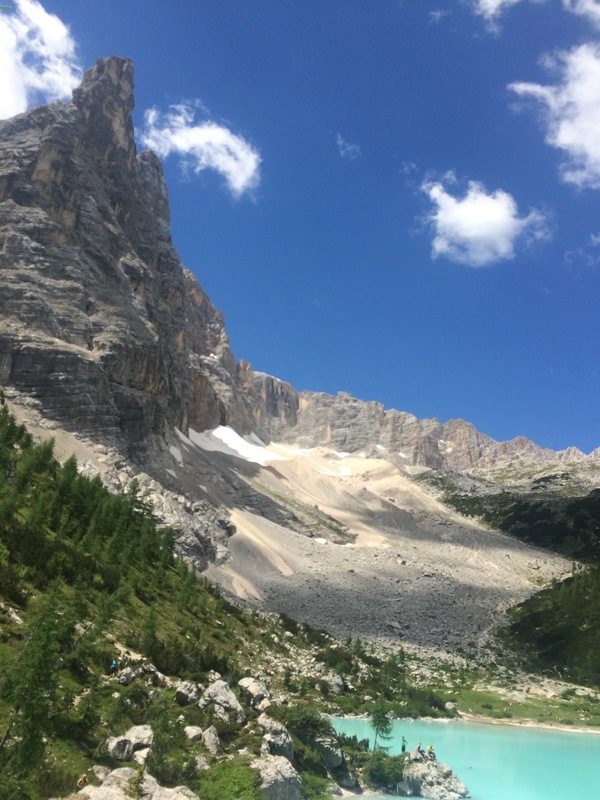 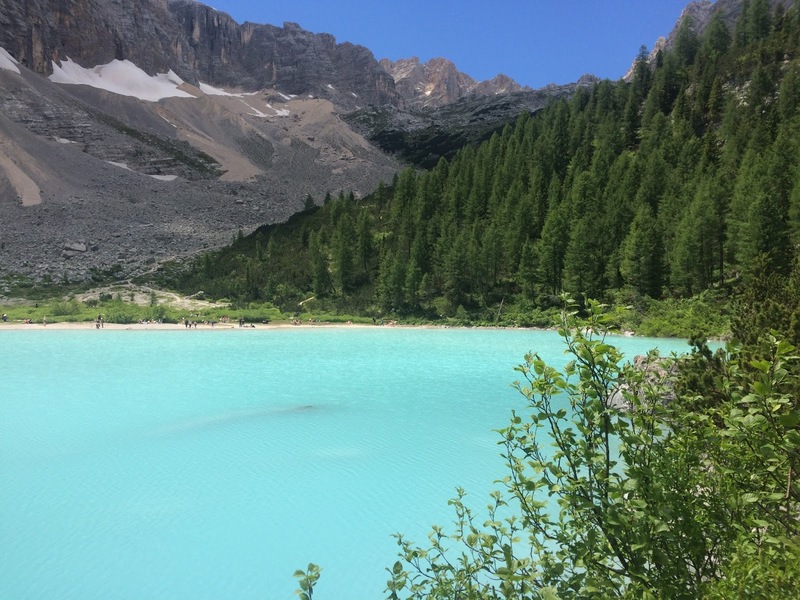 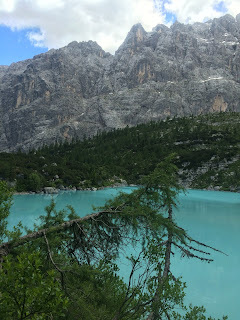 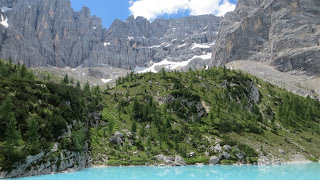 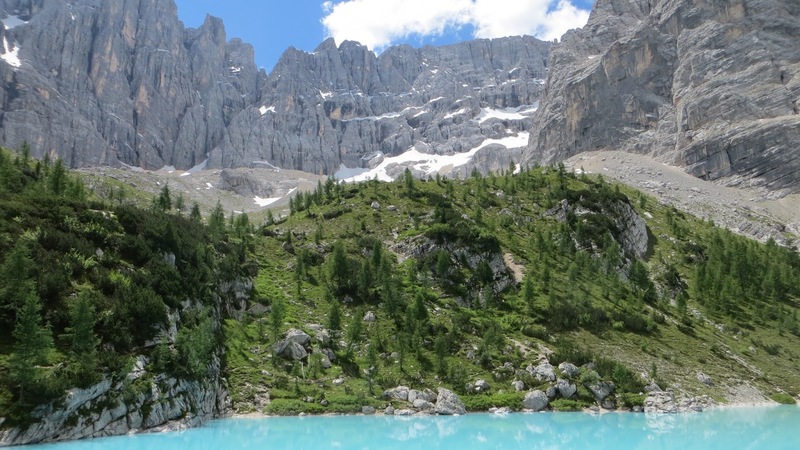 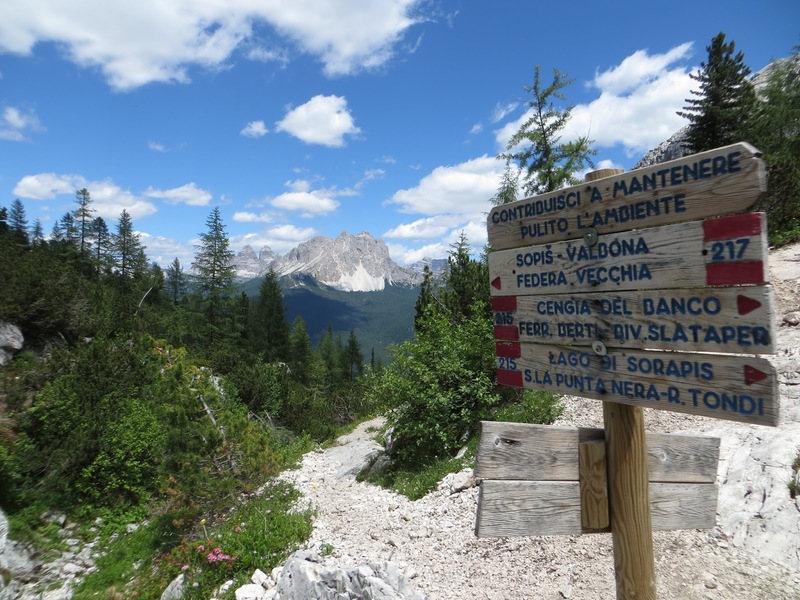 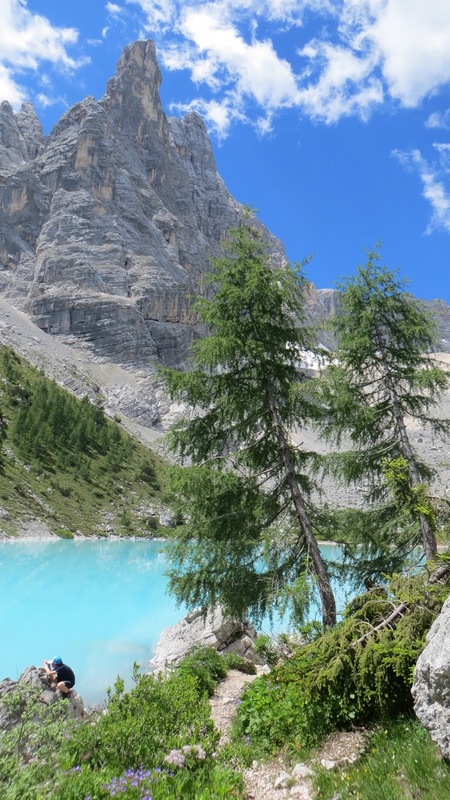 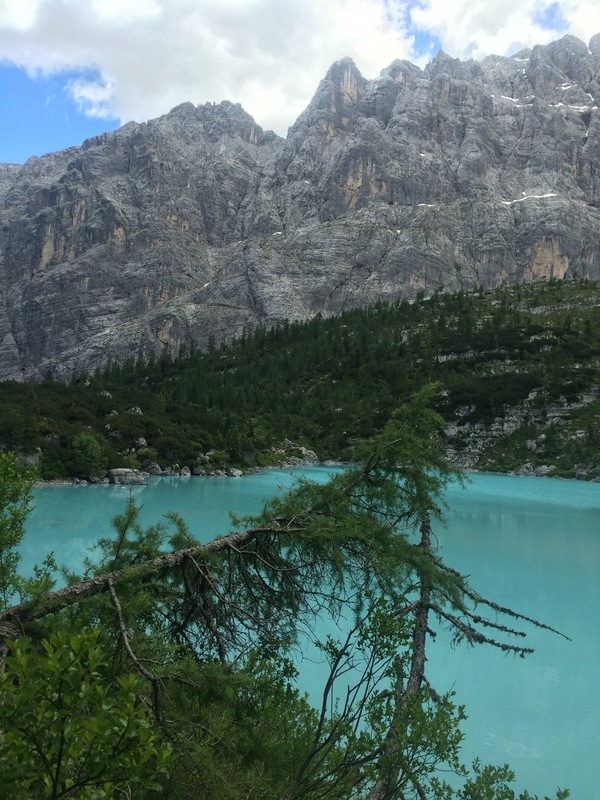 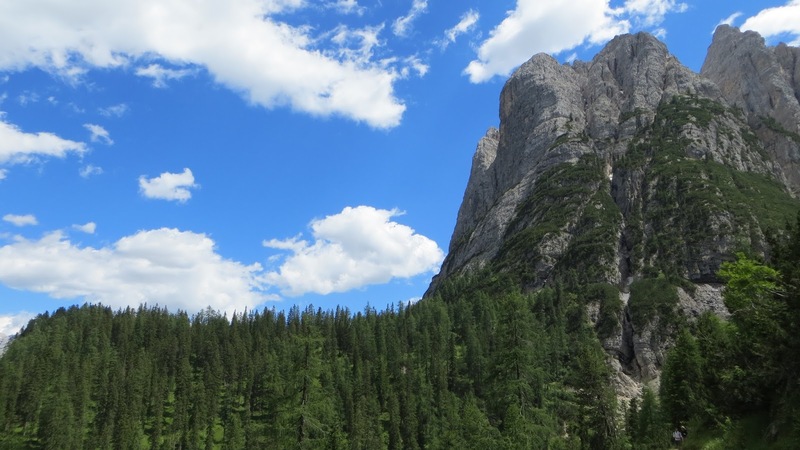 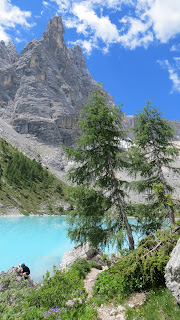 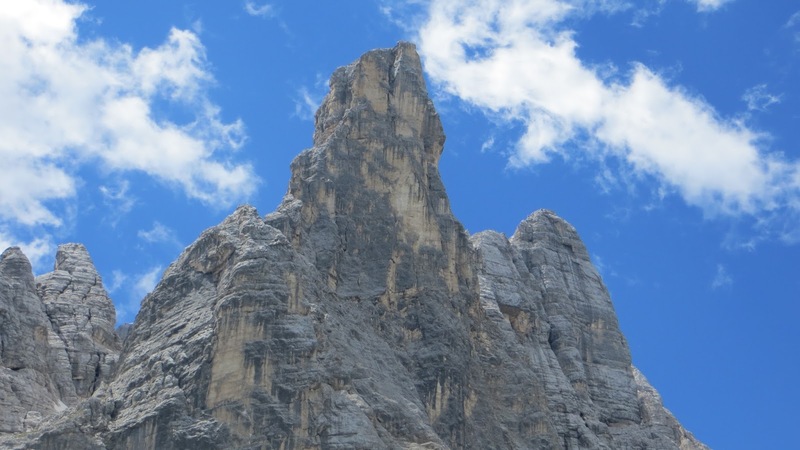 According to tripadvisor, Lago di Sorapiss is listed as the first of 'Things to do in Cortina d'Ampezzo'. So that's why we were now sitting in the bus to the trailhead at Passo Tre Croci (1805m). 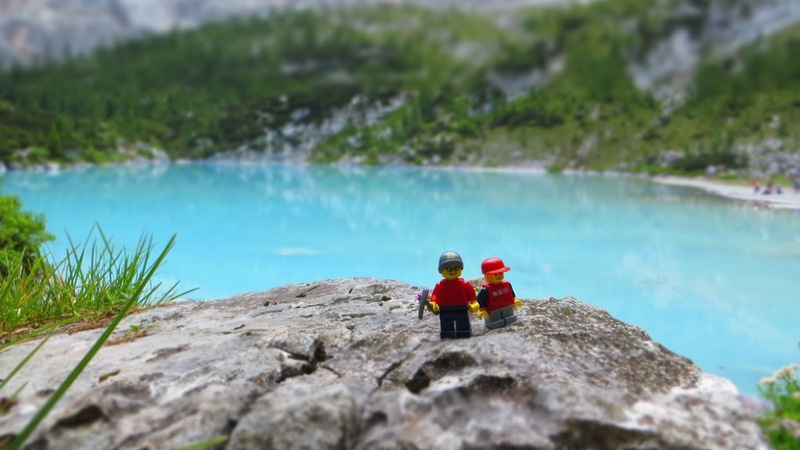 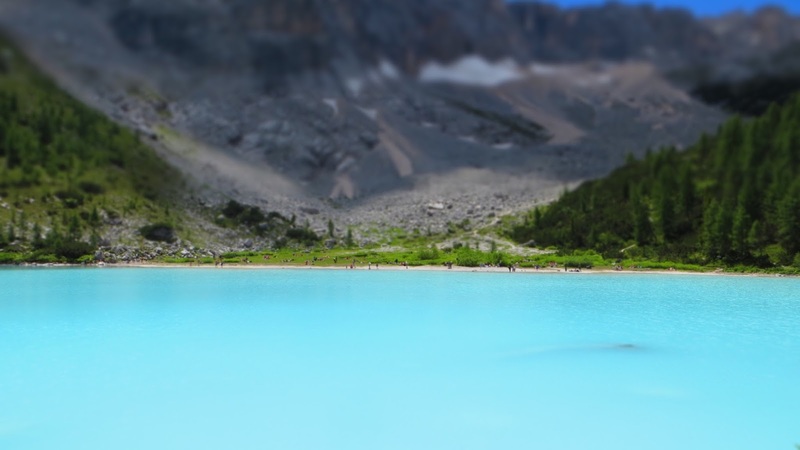 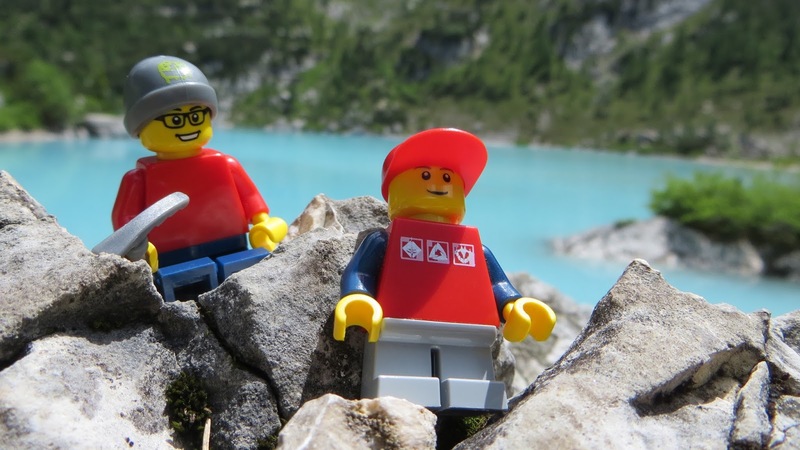 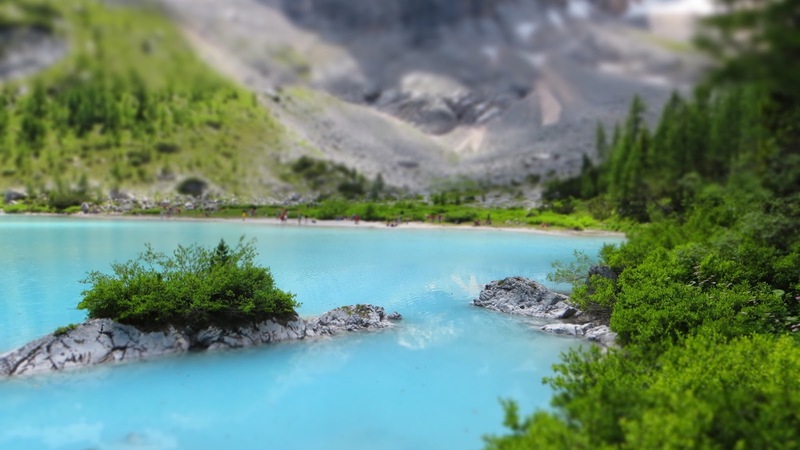 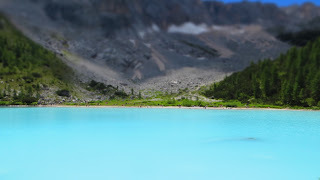 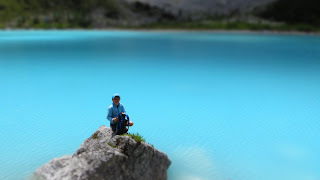 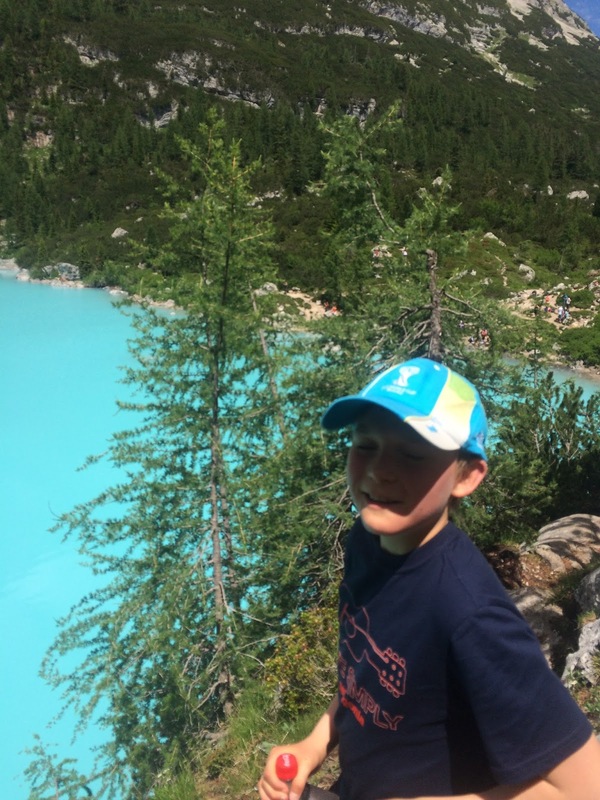 We were not the only ones who had decided to take a closer look at this famous turquoise mountain lake. 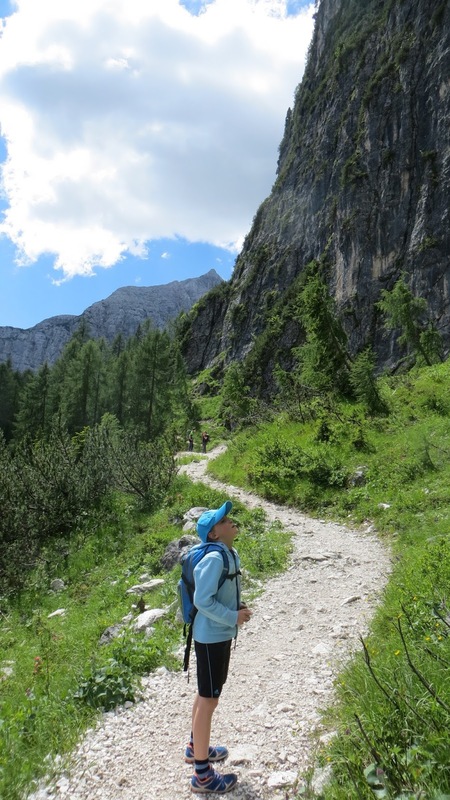 Trail 215 was full of international hikers of all ages. On Saturday a thousand runners (including yours truly) had ran this part of the trail in darkness during LUT-event, but we had soon taken a left turn for Lake Misurina. 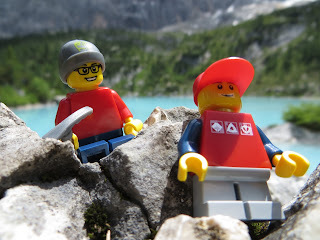 There was no shortage of friendly people to chat with. 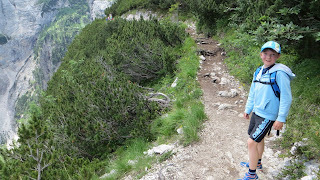 Whenever we felt like passing, we just asked for permission and were always allowed to run forward. 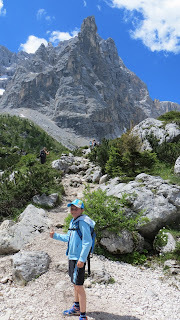 Everything went smoothly although the trail was more demanding than we had imagined. The steeper sections had steel cables and in one case even stairs bolted to the rock wall. 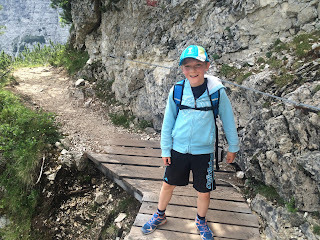 This wasn't a problem at all for us - on the contrary, it was good news! 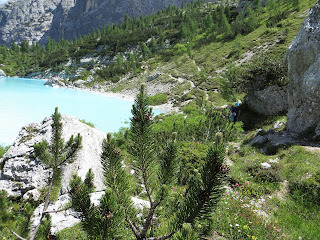 We reached the lake in about 85 minutes without pushing too hard at all. The lake was really fabulous. There are no words to describe how stunning the lake and it's surroundings looked, especially on a gorgeous day like this. We felt that we were very lucky to be able to visit this place 1923 meters above sea level. There is also Rifugio Vandelli nearby, but we passed it without going inside this time. We carried enough food and drinks for ourselves. 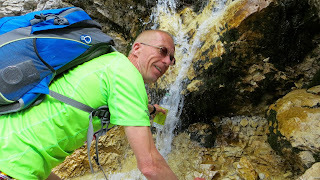 You can also drink the water from several mountain streams along the way. 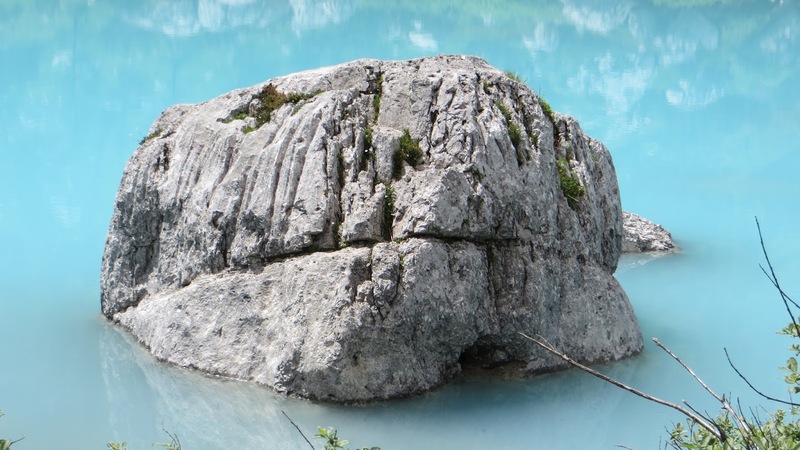 Oh by the way if you plan to go around the whole lake, you should know that the eastern rock wall section is pretty technical. 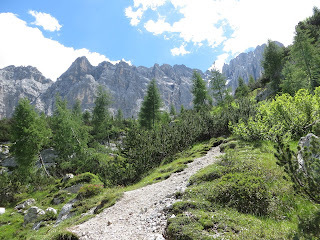 At one point the trail vanished and it seemed to me as if there were nowhere to go. 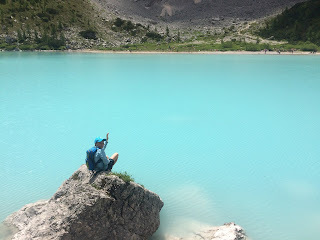 I suggested we turn back, but TPjr had an idea. 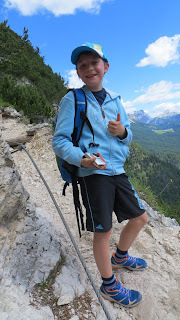 He rock climbed across the wall like a pro. 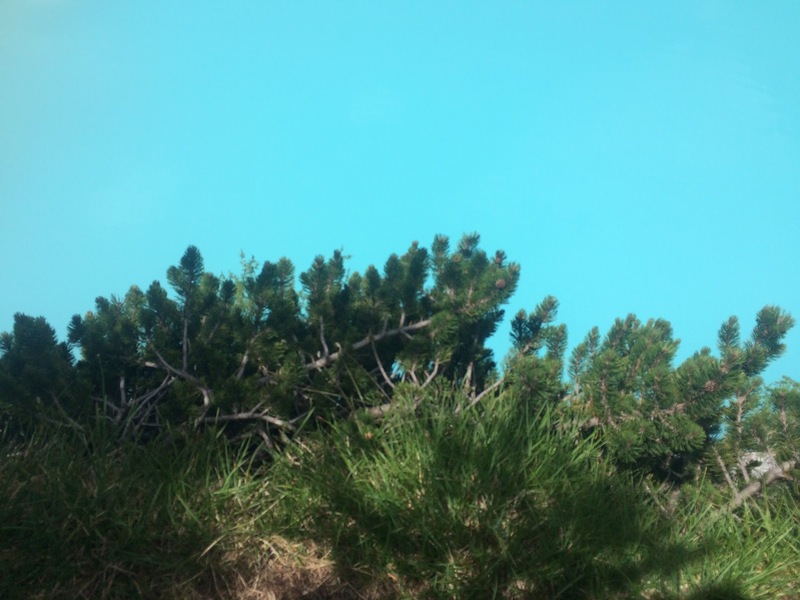 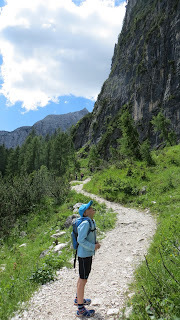 I had no choice but to follow with my heavy backpack and trembling knees. 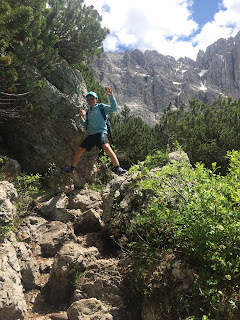 Actually I crawled through the 'windowsill' part (as I instantly named it) and was eventually able to reach TPjr lying on the green meadow at the other side, smiling at my heroics. We had a nice picnic on the 'beach', although it really wasn't a beach at all, it just looked like it from the other side. There were tons of tourists there, but no swimmers on a hot sunny day - how strange. 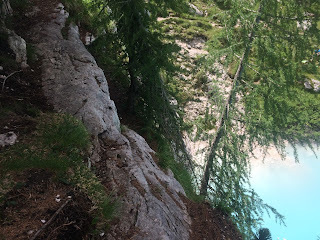 After we stepped in we understood why: the water was ice-cold and the bottom was rocky! 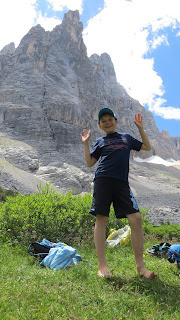 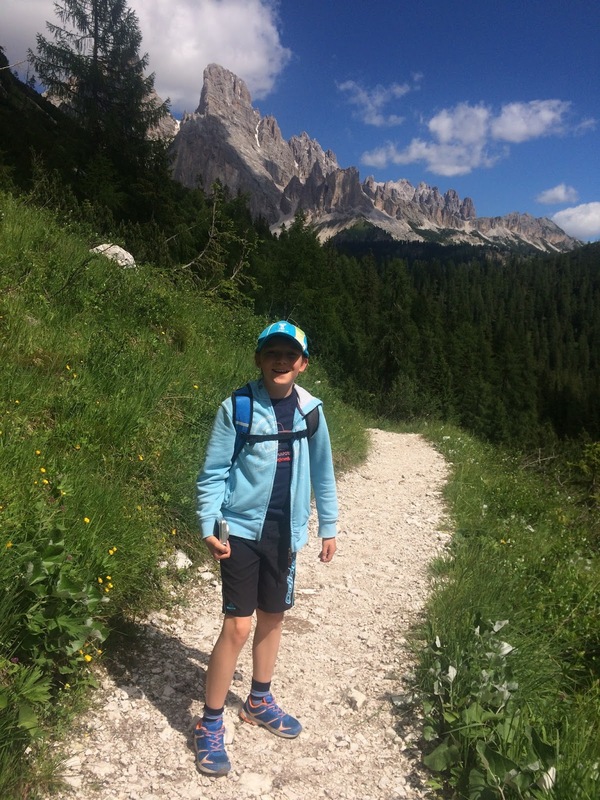 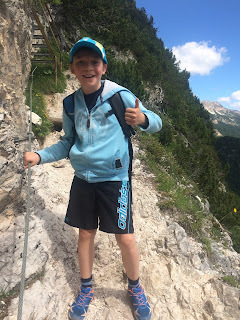 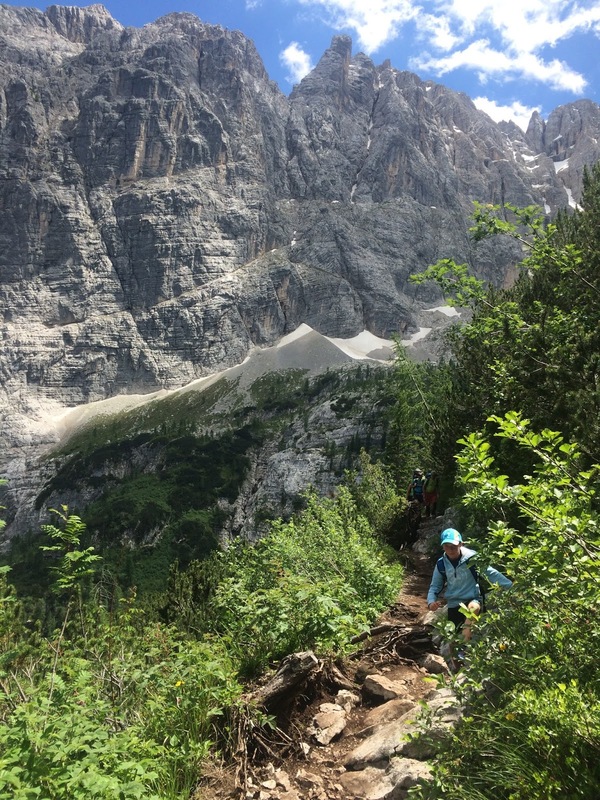 We took the same way back and were safely back for an early dinner in Cortina (1225m). 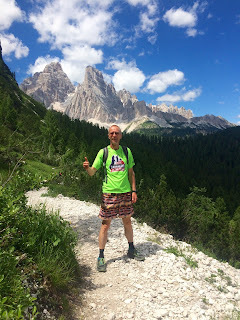 My Suunto GPS data is here if you want to see the whole 13.5km trailrun with 430m ascent. 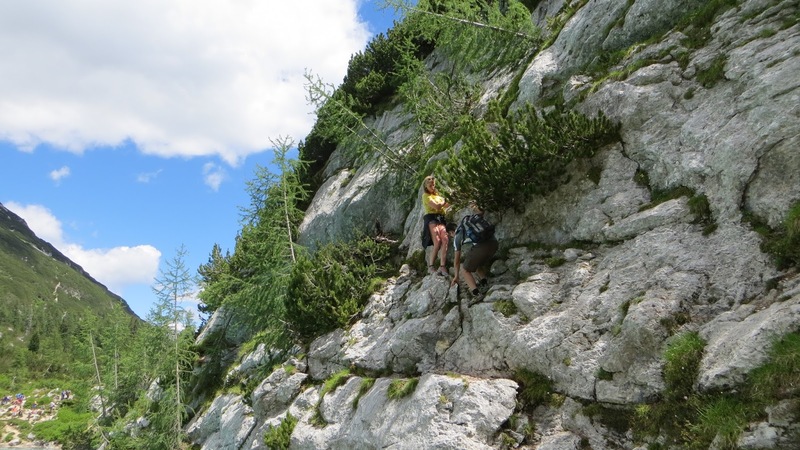 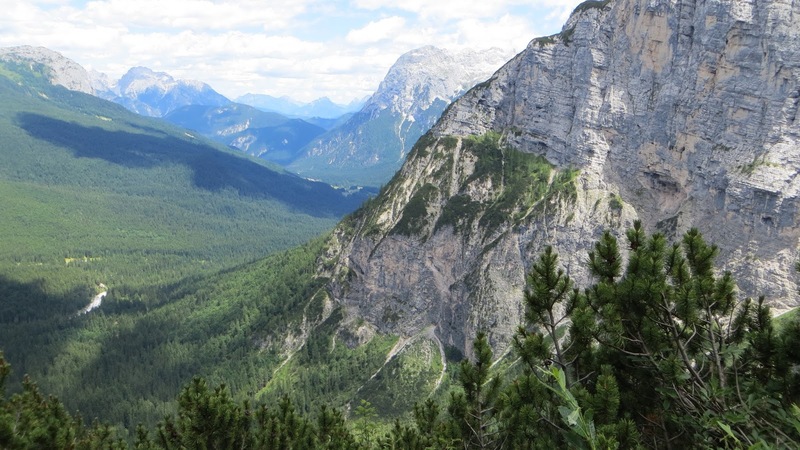 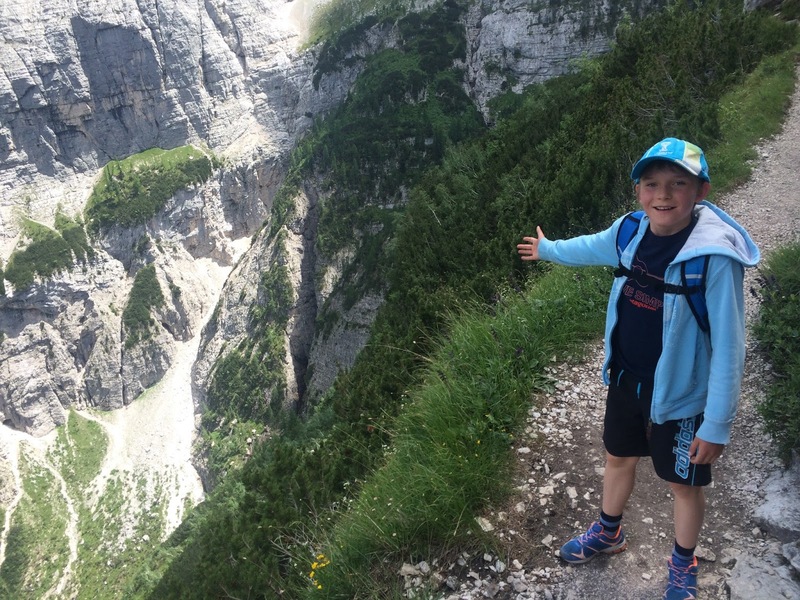 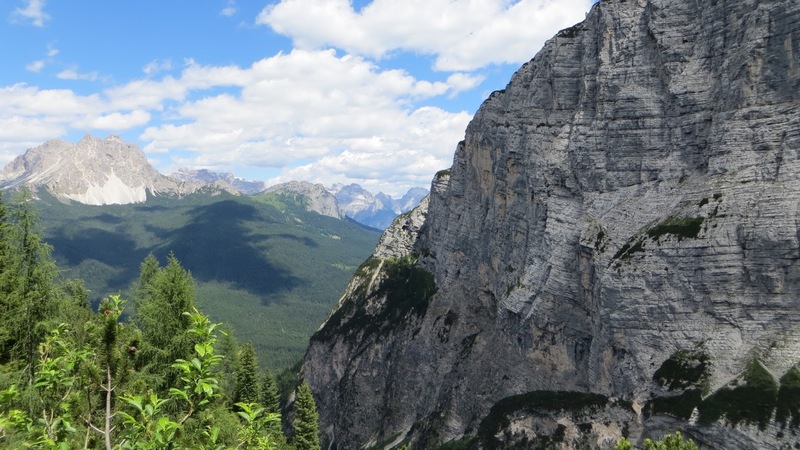 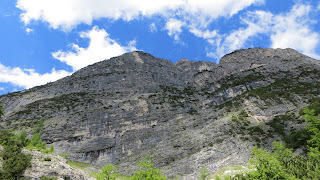 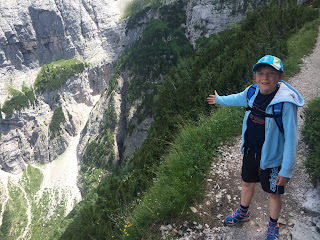 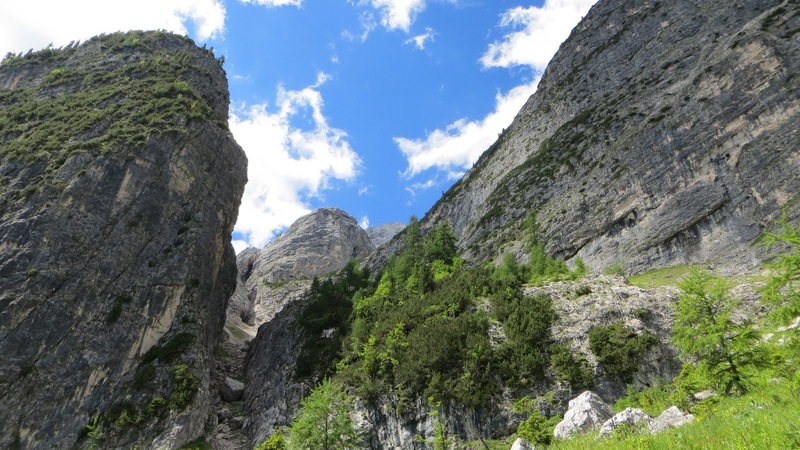 We are pretty sure this is the most awesome trail in the Dolomites. Just look at the pics and enjoy!